Hardcover, Linen with jacket, 560 pages, 13.5 x 21.5 cm, 5.3 x 8.5 in. It was with his four-volume Echo Sounder [Echolot] that Walter Kempowski found a literary form for our collective memory. In it, he kept everything that was in danger of being forgotten. His own diaries, however, which have been published at irregular intervals for more than 15 years, are the literary place for his own personal memory and give us a fascinating view of the inner life of the man who, along with Günter Grass and Martin Walser, must be the most important contemporary German writer. Walter Kempowski once said that he couldn't understand that there are writers who don't keep a diary. He himself had, for many years, been in the habit of keeping one, a daily exercise with which he reacted to events with seismological sensitivity in his efforts to cope with all the little and big tragedies lying in wait for him. 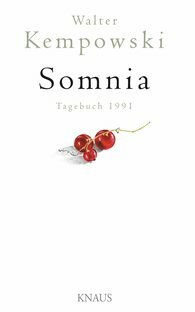 After Sirius, Alkor and Hamit, Somnia, his diary for 1991, is now being published. Somnia is Latin for dreams and should be understood in a wide sense of the word. The dreams are the ones he had, the ones Walter Kempowski wrote down the next morning; they are also the yearnings of his mind – some of these dreams, like German reunification, came true, others didn't. Historically, 1991 was an eventful year. The first Gulf War, the "Mother of all battles", has found its way into the diary; so have the putsch against Gorbachew; Yeltsin's rise to power; the end of the Soviet Union; the beginning of the war in Yugoslavia; the decision in favour of Berlin as the capital of Germany; the threat of introducing the euro. The charm of these notes is in no small measure due to the fact that Kempowski reacted immediately to all these occurrences, gave free rein to his emotions and was not bothered about political balance, let alone political correctness.